Fuyuki is fretting over his underwear as they are having their yearly health exams at school. 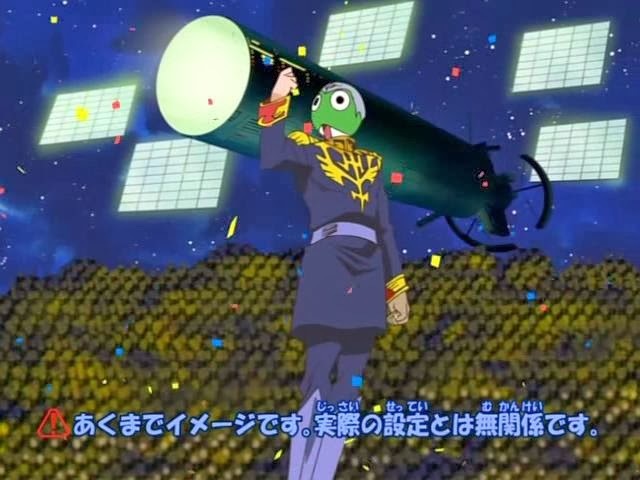 Keroro hears about this, so he and the platoon don human-sized disguises (showing their real faces) to take the part of doctors; Keroro takes the part of a nurse. Giroro is not happy about this until he hears of Keroro’s plan to grow their army. However, Keroro just wants a bunch of servants, so Giroro is unhappy again. Natsumi learns of their scheme and goes to bust it up. 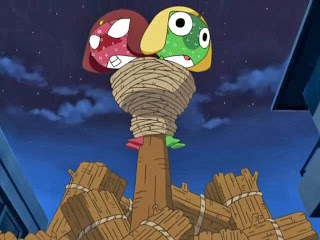 Keroro and Giroro get snared in one of Koyuki’s and Dororo’s traps. Keroro cons Dororo in order to escape, whereby the foursome flee to where Fuyuki’s grade are being examined. Keroro busts in as Fuyuki is taking off his pants, causing both to end up outside, where Fuyuki in his underpants are there for everyone to see. Fuyuki is angry, so Natsumi makes him cookies, which he refuses to come down for. Keroro, fearing the blame be shifted to him over the underwear incident, stokes their fires so that the two agree to battle it out. The first contest is arm wrestling, in which Natsumi easily beats Fuyuki. Fuyuki wants a change of contests, so they shift to Indian Poker. There, Fuyuki wins two battles, but in the third, he loses because Natsumi recalls their earlier childhood playing Trump, when her facial expressions gave away what kind of cards she had. So she manages to fool Fuyuki and win. She tells Fuyuki of her memories and he also remembers that time fondly. The two reconcile, and Natsumi gives cookies to all. Fuyuki reveals that he was angry about a magazine Natsumi trashed. She didn’t do it, so when it is revealed that Keroro had Giroro burn it as trash, Natsumi burns them at the stake. Another couple of fun stories to be had here with some minor bridging between the two tales. For the first story, there was the parody of the usual health exams performed on Japanese kids at school, with the Keroro Gunsou twists. As such, it was amusing to me, though I didn’t understand Fuyuki’s obsession over underwear at the beginning of the episode unless he doesn’t normally wear the stuff. The first story was also crammed full of Mobile Suit Gundam references, including the various senior members of Zeon, right down to the “Sieg Keron” instead of the infamous “Sieg Zeon” in Gundam. That made me really laugh. I’m glad I’ve watched Gundam now so that I Gundam jokes like the ones here. The second episode was fairly simplistic and predictable. 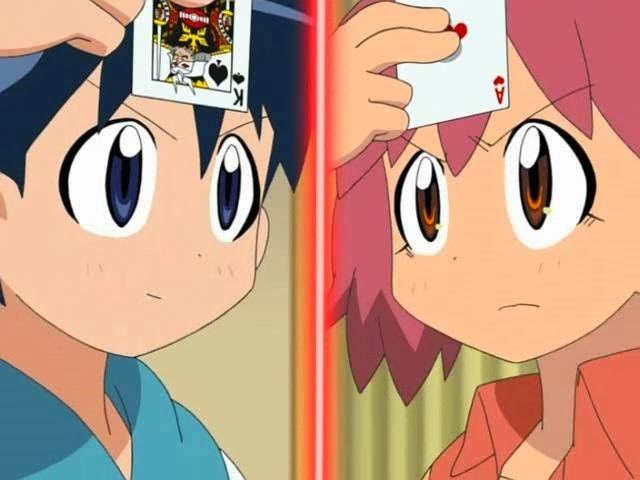 I knew there would be no way for Fuyuki to beat Natsumi at physical contests, and Natsumi would be hard pressed to beat Fuyuki in cards. Still, things were fun enough, right down to Keroro and Giroro being punished at the end for burning Fuyuki’s magazine. I’m glad these episodes have been pretty fun since my return to the series. I hope the rest will be as well. Fuyuki was angry over losing his magazine the whole time instead of the underwear incident? 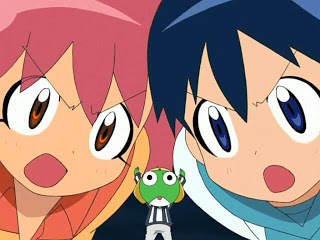 Yeah, that was part of the gag of the episode so that Natsumi could punish Keroro and Giroro.